Sometimes it is hard to remember what I did all week. This will probably be a short weekly update because I don't have much of anything to add for World of Chalk or Volchaos. Both games had a little progress and are progressively better than last week but nothing really worth mentioning in detail. I received my WP7 device on Monday (despite paying for overnight shipping on Wednesday of the previous week) and finally got to testing of Hypership on a real phone. This lead to some tweaking of the gameplay, changes to the engine to improve performance (fewer but bigger particles on blocks and lasers, removed particles on items which you really couldn't see anyways), and even some control changes. The biggest updates though came in the way of the Online High Scores. You can now easily register a username (as simple as entering a name which is then tied to your unique WP7 anonymous ID) and log all your high scores. I still need to handle issues when errors arise in the process, but the normal path works great. I'm planning to push out a test version this weekend / next week so others can try this out too. The game now has three full waves. Because of the smaller screen size in the WP7 version (480x800 vs. 1280x720 on XBLIG), all the levels needed to be reworked to fit. While waves will have similar elements and themes as their XBLIG cousins, they were all built new from the ground up. So you'll need to learn new patterns if you expect to get the highest scores this time around. There will also be one totally new level. Originally when I designed Hypership, I was just going to do 5 waves. You'll notice that wave 5 (or was it wave 6... I forget!) in the XBLIG version is a mashup of all the previous waves. This was intended to be the final wave of the game. When I decided to do 10 waves, I didn't want to scrap this wave but doing a mashup of 10 waves (rather than just 5) would make for a much too big wave. Anyways, I won't be doing this for the WP7 version. There will be a brand new level instead. And it will have spaces bees in it. I'm really amazed how quickly this game has come together. Developing for WP7 has been a breeze so far. Ports are far easier than new games too. I expect Hypership to be completed and released for WP7 by the end of this month at the latest. I have high hopes for this game too. While I'm not seeing very good sales numbers for WP7 games, several developers are doing quite well with ads. Hypership will launch as a free, ad supported game with a full ad free version coming later. 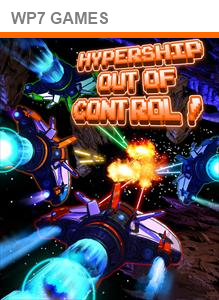 Hypership sales were a disappointment on XBLIG but I fully expect it to do much better on WP7. I hope I'm right! In case you missed it the other day, I was on the Just Press Start Developer Roundtable along with Nathan Fouts of Mommy’s Best Games, Matthew Doucette of Xona Games, and Robert Boyd of Zeboyd Games. The main point of discussion is the ratings controversy going on with XBLIG lately but we also touch on some more general XBLIG topics. If you're interested in XBLIG at all, I really recommend listening. It was very cool to be able to get together and discuss these topics with everyone. This article has been view 1177 times.